Yes it's TRUE, I am selling off my HR horse collection. It's been a VERY hard decision to make, but as things stand right now, I must let them go. Between some of our older cats having health issues, as well as mine, I think it's the time to let them go. I have marked the SOLD piece's in RED, these already have NEW HOME'S. I have a price on every piece shown on my website. If you see a model you want (please use the model's name) then just contact me. It has been a long journey over so many years. Hi my name is Dee Whitley - though the oldie in the hobby knew me as Denise "Dee" Nelson. I started out collecting model horses at the age of 9. Like so many other of my generation, us baby boomers were introduced to so many new manufactured goods. Horse figurines were not an easy item to find until the Japan market opened up and soon a flood of Made in Japan ceramic horses & other animals were everywhere. They were inexpensive for the most part and some were nicely painted. I think that's when my fever for collecting horses really started. That was in the last 50's. Also just about that time a new company came on the market place called Breyer. They started out making a few horse & rider sets, a clock, a line of Woodgrain horses & animals and they were made out of plastic. What a concept. Plastics were fairly new and the prices on these pieces were unbelievable. I remember staring up at the shelf of woodgrain Breyer horses, and checking every price tag to see if I could weasel one out of my Mother as she was a stay at home mom. The most expensive Breyer at that time was $4.95 and that was the Woodgrain Longhorn Bull. The horses were priced starting at $3.95, $2.95 & foals at $1.95. Now at this time in my life my family was kinda on the poor side. Don't get me wrong my Dad worked hard, provided my Mother with a newly purchased home, and had 3 kids to raise. But as for "extra" money to spend on such non-since things as a plastic horse, nope, you can't have it. So, for a while I was only able to buy the Japan horses, which some at that time were as cheap as 39c. In the next couple of years we gained allowance money to do any number of odd chores. 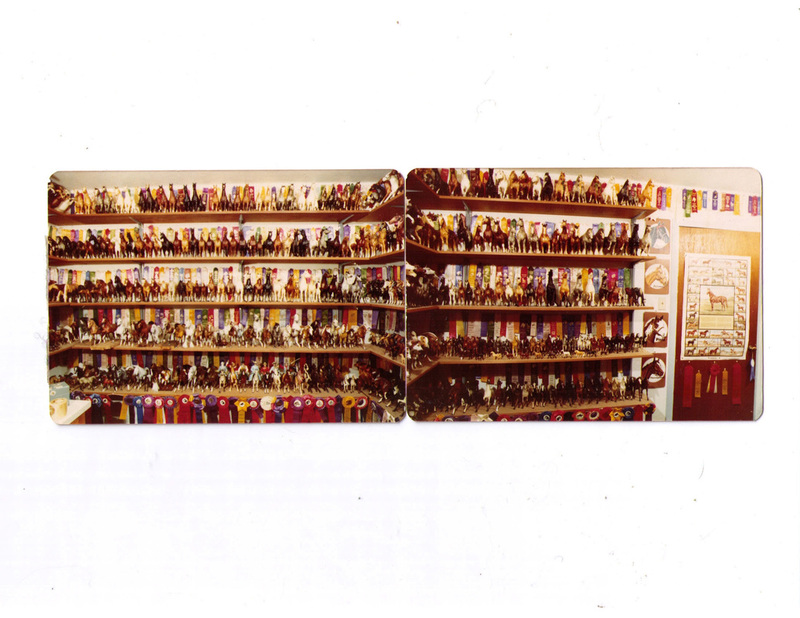 This was when I became a true Breyer collector. My girl friends at the time were also horse crazy, I think it was running rapid during those years. We all though dreamed & played horses as much as we could. Well, not really a surprise with TV shows like The Lone Ranger, National Velvet, Flicka, Bonanza, etc being on TV almost everyday! It was a few years later that yet another company came out with some more plastic horses, there were called Hartlands. These were available at our local 5 & 10c (Dime Store). You could get a boxed family of 3 for $4.95. It was like going to heaven....horses everywhere! Well come to find out years later, these china horses us kids had been drooling over were made by a company called Hagen-Renaker. The prices then were still out of my personal price range the small ones going for $3.95 and went up from there. To a kid living in a poor home, it was not an option to have a luxury like them, so I never got one while I lived at home. Funny, my girl friends whom were better off had small collections of the HR mini horses. I remember going over to look at them. We weren't allowed to play with them, per her Mom, "they were just to look at", and look we did. As you can tell from my early home life, Hagen's were not an option till I was out of the house and able to make my way in the big world with a job. During this period I found out about showing model horses! WOW! What a concept...and just up my alley! This was mid to late 60's. My idol at that time was an amazing lady named Linda Walter, living on the east coast, whom published the first model horse magazine that I know of. It just added fuel to the fire of model collecting. And it spurred on a total new direction, photographing. It was a fun new avenue & learned a lot for future years. In the late 60's I got married, had a son, and no money once again to buy fancy extras like china horses. Oh, I still had my old plastic Breyer horses, and occasionally I would find a china horse at a flea market, but I still had to bide my time before I was really able to start china horse collecting. I used the stable name "Autumn's Heritage Farm" as each shower had a name they chose to show under. All my horses shown had the word Autumn before their name. In the early 80's I started a mail order business for model horses called "Lil" Bit Country". It was a new venture & I truly enjoyed ordering & shipping orders. I lucked out about that time when Hagen-Renaker was releasing the San Marcos line of horses & animals. I was able to get enough funds up to start ordering directly from them. It was during this time is that I once again started using my old school nickname Dee, just a shortened up version of Denise, seems like it always stuck with me all my life. This period in time is when I learned how to do china restorations. I loved it. It was a challenge and something I really enjoyed. Now I was "finally" able to start my long desire to collect Hagen-Renaker horses on my own. This was around the time I started a china horse club called the Hagen-Renaker Association Club (HRAC). I was the editor for the clubs monthly news letter also at that time. This club ran for 10 years. I was one of the first companies to order a Special Run of non standard production colored horses through Hagen-Renaker, to give my club member's a chance to get a Special Run. This was in 1985. I offered several different pieces, like the Special Run Two Bit, Erin & Shamrock Quarter Horses in Palominos, both in matt & gloss finishes. I ordered 25 of each piece and in each finish. I still have the original invoice dated 1985. I also was able to have a limited "Numbered" run done. It was the first time a hand numbered run had been done. They were the Coco SIlk QH Mare done in dark Bay Appaloosa. They were numbered in Gold between the front legs. Things seemed to really be going my way, but never say never....the marriage took a turn for the worst, and things from the business had to be sold off. That included most all of my life long horse collection. See pics below of what my special room looked like.My collection at that time it was close to 1,300 Yep, it was survival of the fittest and I had to get back on my feet the only way I could now being single. It was during my absence from model horses of a long 13 or 14 year break that I got to pursue one of my other dreams in my life and that was to build & show a real car. After pouring in my saved monies from the last sales of my horse collection I was able to help build up from scratch an awesome street machine, a 1965 Pontiac GTO. Totally customized. It was a dream come true. The only problem was I was playing on the "boys turf", it was a man's hobby, NOT for a women. So to get into the field I would get to the car show before anyone else, clean my car, put my window place card in my car's front window and walk away until the judging was done. I also couldn't use Denise on the judging card cause that would show them I was a woman... so I once again I was back to using Dee and it worked. As Dee can be a guys name too, they finally accepted my car & me into the show world. Weird but true! So, during my car shows to so many different towns & cities, I had idol time during the day awaiting the car judging , so I spent a lot of time looking around different towns.. This is were I "once again" caught the horse collecting fever as I was finding some china goodies almost ever time I went some where. Yep, you guessed it the China syndrome was back, it never really went away. Got a good job, and found that the world of model horses was NOW on the internet! OMG.....the china syndrome started all over again! Showing on line was so different that photo showing, but it really was fun. I got back into restoration work again, and I was happy once again. About 4 years after my moved to Oregon I was diagnosed with osteoarthritis in both hands. It was devastating news, but I knew something was going on as they hurt all the time. I would sit in my car after work and just cry for a while before I could drive home from work, it got that bad. I'm now disabled and can't work. I keep busy by finishing up some personal restorations, as my hands permit. 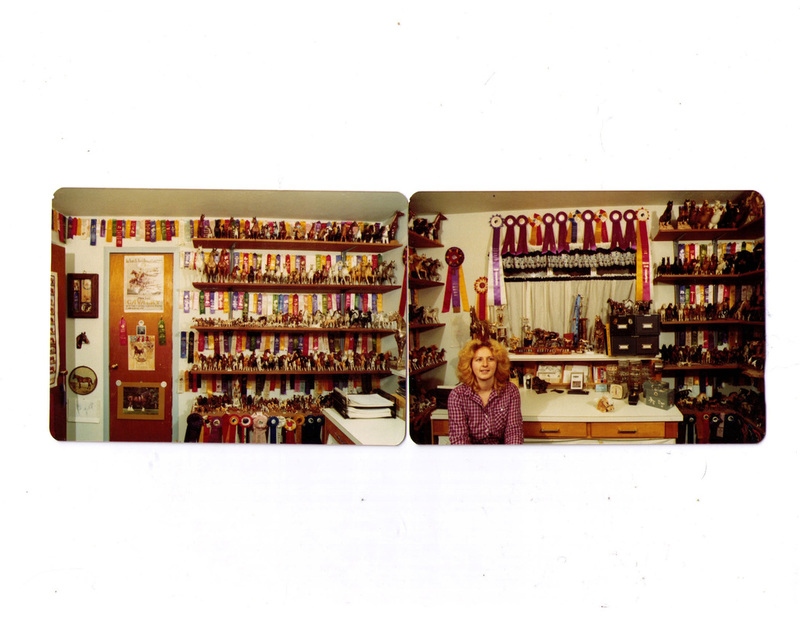 I also try and make HR sized Arabian costumes & tack if I can now and then. I didn't mean to bore anyone with my past life, but more to give you a feel of who I am. Anyway enough of that, I hope you will enjoy what you see on the many different pages on my web site, I am so happy to "finally" have a nice collection and HOPE you will also enjoy something you see. Click on any pic to see a larger size. And lastly here, I TRULY WANT to THANK everyone whom has helped me add a piece to my collection. I have gotten to know some WONDERFUL people through this. Note: PLEASE do not use any pictures off my web site without my permission. All photo's were taken my myself and are my personal property. Remember model horse showing & collecting is a "small world" and use of my pics or for that matter anyone else's without permission is against the law.